Tauranga Moana gathering to perform a haka to show support and solidarity with Native Americans protecting water and land against the Dakota Pipeline. Haka with Standing Rock was a nationwide movement and many mass haka have been performed in support of the Standing Rock Sioux tribe who were peacefully protesting the construction of an oil pipeline in North Dakota, which they fear would threaten their water source and sacred sites. In front of Moturiki Island (Leisure Island) at 3pm today local Maori would stand united as tangata whenua. After a karakia, korero and short hikoi a haka would be performed on the beach. Organiser Drew Tata said Tauranga Moana were responding to a call out to Aotearoa from the elders at Standing Rock to show their support for the tribe. 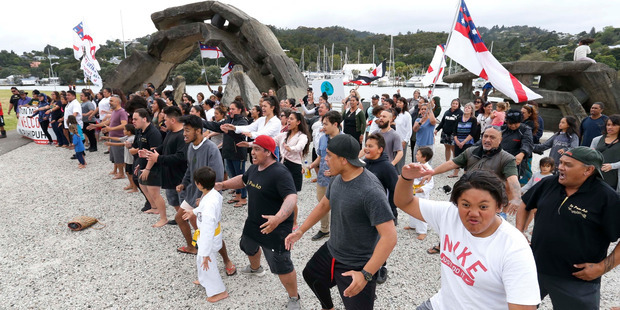 "There's been a big groundswell of people around Aotearoa performing mass hakas in support of the peaceful protest happening over there at the front lines. "Our main purpose is to stand and support our indigenous whanau and as tangata whenua and show them our love, support and gratitude for what they're going through at this sad time," Mr Tata said. Responses to "Tauranga Moana haka in solidarity with Standing Rock"
Thank you, Thank you, Thank you. Your support is an inspiration. If only you could come to Standing Rock. A Haka here would surely be welcome. Water is Life..., Saying hello.